During the 2013 football season Ryan Tweedy and David Max will be touring the state of Nebraska and other locations to provide screenings of Ryan's Nebraska Cornhuskers documentary film titled Through These Gates. More information about the tour can be found here. Ryan Tweedy was born a Husker and will die a Husker. He is a film editor in Los Angeles and has been filming and editing for this documentary all over the United States for a year and a half. More information about the documentary and Ryan's associates in the film making process can be found at the film's website Huskersfilm.com. David Max is the co-founder of HuskerMax.com and the author of the book 50 Years of Husker Memories. Ryan and David will personally attend each screening and be available for a question and answer session about the film and the book and will autograph copies of the DVD and the book. The entrance to the University of Nebraska’s football stadium reads “Through These Gates Pass the Greatest Fans in College Football.” This film puts that statement to the test. It is an exploration of a state, of a town, of people’s relationships, of thousands of students, of the power of a strong leader and mentor and the love of countless athletes who came into contact with a football. It is a glimpse into the world of the Cornhuskers....the self proclaimed greatest fans in college football....and by all assessments the claims they make on their stadium gates may be right. This film follows several individuals associated with the University of Nebraska football community through different life lessons including the mother of a player who passed away and continues to be supported by the football community, the Defensive Coordinator who gave footballs to Husker fans all over the country, a former player struggling with drug addiction, a child with brain cancer who gets to suit up with the team, even an astronaut who is able to see a packed stadium from space on game day. The stories are remarkable, and beyond these, the personal accounts of countless fans are truly inspiring. Through These Gates examines true sportsmanship, genuine community, and unconditional love. It’s not just a film about watching football. It’s a film about people needing one another. Here is your chance to see it in the Bay Area. Time: Social Hour 6:30 PM and Screening at 7:30 PM - Question and answer and autograph session after the 90 minute screening. Cost is only $10.00 person. Join us on October 20, 2013 for a fun event. Event starts at 4:00 pm with game starting at 5:00 pm (PST). All Husker Fans are welcome to join us, even if you do not purchase any pizza. Walk-ins for pizza are welcome - but without a reservation, pizza is not guaranteed. We need the reservation and payment to know how many pizzas to order. Most Spirit Awards - Prizes are a $10.00 Red Zone Gift Certificate. Bay Area Husker member only raffle at half time. Must be present to win. Trivia Quiz - Prize Awarded. Do not miss out on our Annual Bay Area Huskers Bar-B-Que. Time: 10:30 a.m. - 2:30 p.m. (Food service available from noon - 1p.m.) Games may start earlier and can extend past 2:30. There will be a raffle. Prizes include Husker Gym Bag, Husker Clothing and other items. Do not miss out. There will be a special raffle for Chapter Members who can win the two Husker Chairs below. 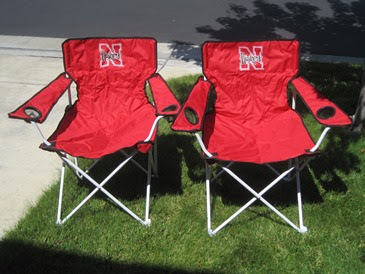 Bay Area Husker Chapter Members who have paid their 2013/2014 annual chapter dues and are present at the upcoming barbecue will have the chance to win two Husker Tailgate Chairs. You can pay your membership dues when you attend the barbecue or go to http://bayareahuskers.org/ to become a Chapter Member for 2013/2014 and become eligible for the drawing.Visit http://bayareahuskers.org/ to sign up for this fun event.